We'll teach you to consider structural integrity, the character and location of a site, methods of construction, value for money, design quality, impact on the environment, as well as the legal responsibilities for life safety and statutory consents. Full completion of the apprenticeship qualifies you as a Master of Architecture (MArch) and provides you with Postgraduate Diploma in Professional Practice and the professional award of RIBA Part II & III. The architects are educated, trained, and registered professionals who plan, design, and review the construction of buildings for a client. They use their skills and knowledge to offer creative problem solving and strategic advice related to various types of building, arts, and construction projects. This includes developing building designs taking into account a range of complex issues such as structural integrity, the character and location of a site, methods of construction, value for money, design quality, impact on the environment, as well as the legal responsibilities for life safety and statutory consents. Architects work responsibly to deliver the interests of their clients and the core requirements of cost, time, and quality for the end user. This course is 3 years, plus 1 term part time. Apprentices usually attend university one day per week for the 15 week first semester, and one day per week for the 15 week second semester. The day in at LSBU will be communicated well in advance to enable apprentices to plan their working week in practice, and does not vary from week to week. Professional accreditation – the course is fully validated by the Royal Institute of British Architects. DesignDesign at LSBU is taught in four postgraduate studios. A presentation is made to apprentices at the start of each academic year, outlining the scope and character of the studios offered on the MArch/Diploma programme; apprentices vote for their choice of studios, and those themes reflecting their individual interests in architecture. Within the first month of the course, apprentices may review their studio choice and request a studio change if feasible. Design studio projects are introduced in small group apprentice-led seminars; these are followed by individual evaluative tutorials. Apprentices make interim presentations of 2- and 3-D analogue and digital material to their studio staff, peer group, and invited critics illustrating the scope and detail of their emerging design proposal. Apprentices also make a final presentation of 2- and 3-D analogue and digital material to the studio staff, peer group, and invited critics illustrating the scope and detail of their developed final design proposal. All design studio work is subject to continuous assessment. Studio tutors monitor design scheme proposals throughout the semester, and collectively moderate assessments at each semester’s end. Individual feedback on scheme proposals is provided at every individual studio tutorial. 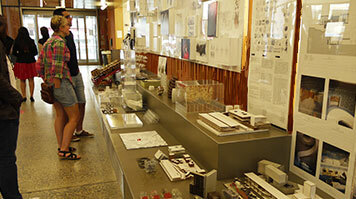 An evaluative, critical summary of design studio project is provided at all students’ final presentations. 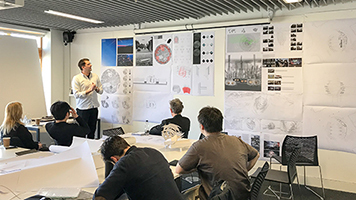 Provisional grades are given at the end of semester 1, with all apprentices offered opportunities to review, revise, and add to their design studio submissions. Technology 5: technical thesis This module is a taught course and two reports, including a design studio project-related submission which integrates the thematic interests and methodologies of the postgraduate design studios, develops the technological focus of the final studio design project, and reflects the requirements for material qualification of the graduation project/s through making. There is an opportunity for students to develop production drawings and medium scale physical constructional elements exploring, in 2- and 3D, creative interpretations of materials, components, and structural systems technologies underpinning advanced architectural design appropriate to the final year of postgraduate study. By situating architectural design in a material, constructional, and manufacturing environment, students will consider the impact of technical decisions when completing a comprehensive design proposal. It's a chance to further creatively develop students’ structural and constructional understanding, as well as to extend and enhance the technological profile and presence of students’ diploma project (Design 503) through i) a technology report and ii) iterative medium scale physical constructions. They'll understand the means to optimise and convert digitally generated design drawings to production information, and short run component manufacture. The module provides the opportunity to consider design alternatives within the technological parameters influencing progressive architectural design, and expressing these in sequences of 3D elements, constructed in the LSBU workshops. Energy and resource efficiency in design This is a taught course and project submission integrating thematic interests and methodology of studios with requirements for resource efficient and environmentally conscious architectural design. 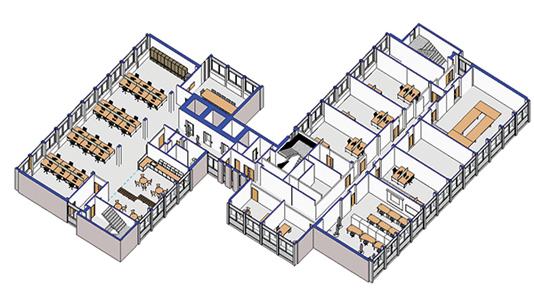 The module considers: development of students’ understanding of energy conservation, and reduction of environmental impact of building materials and systems; consideration of strategies for resource and energy efficient design relevant to current professional practice; and application of environmental research data to developing design proposals for small to medium sized building undertaken in design studio. History and theory: critical thinking This module addresses critical thinking in architecture in terms of the methodology, historical context, strands of theory, key issues in the production of architectural knowledge, and the relevance of architectural discourse. It is divided into two parts: Critical Readings (component 1), and Research Methods (component 2). The module aims to develop intellectual and practical tools that can be used by students in several ways: to inform and support – and to enable students to define – a critical position; to exercise intellectual capacities that may be mobilised in a variety of professional, scholarly, and lay contexts, thereby enhancing employability; to present and debate diverse architectural subjects in relation to issues of cultural, economic, social, political, philosophical or ethical significance; and to inform the design and execution of research. Architecture and theory: dissertation This module addresses the research, analysis, interpretation and communication of architecture, in the form of a written dissertation on a topic of the student’s choice concerning the histories and theories of architecture. The module aims to introduce the principles and practice of scholarly research, enabling students to: define and elaborate a critical position; organise and communicate ideas in writing; develop a coherent argument expressed in the form of a connected text; and become familiar with the procedures specific to critical investigation and analysis in architecture. Professional practice and design economics This module comprises Professional Practice and Design Economics. The objectives of the module are to develop and question professional practice and practice themes introduced at an earlier stage of study and encountered in practical training experience. Students are introduced to the approaches to comprehensive and critical integration of practice issues with design, design considerations and finance and to a recognition of the enhanced capabilities that this awareness and skill provides. They'll gain knowledge of the professional, legal, and managerial responsibilities of a practising architect, including relationships with other co-professionals. Additionally, they'll garner the ability to develop, test, and evaluate design options and produce architectural designs that meet clients' and building users' requirements, including compliance with budgetary and time constraints, and relevant UK building legislation. Postgraduate apprenticeship as an Architect is a cost and time effective means to the second and third stages of the three stages of professional qualification. The course is for those already working in practice, and leads to the university award of Master of Architecture/Postgraduate Diploma in Professional Practice and the professional award of RIBA part 2&3; apprenticeships in architecture build on the already close relationship between schools of architecture and the professional workplace of the architect. London South Bank University has a long established history of part time professional courses, and enjoys excellent links with all disciplines within the construction industry. Our courses in architecture are fully validated by the Royal Institute of British Architects (RIBA). We have excellent studios, workshops, and AV facilities on site (including advanced digital fabrication equipment), and an architecture team who are committed to every apprentice realising their ambitions. Learning outcomes are mapped against the requirements of the apprenticeship standard published by the Institute for Apprenticeships, which in turn reflect the 11 points of the EU Directive for Architects used for RIBA validation. In each case, the apprentice will have knowledge and understanding of a key area, and specific skills. There is thus an exceptionally strong professional basis for all aspects of the LSBU Architect apprenticeship. The course is unconditionally validated by RIBA and offers the professional award of RIBA part 2 on successful completion. The regular validation cycle ensures that your work is carefully sampled by peer reviewers to ensure course content and outputs retain close relevance to professional practice.